This holiday season has been very stress free for me, my goal was simplicity and joy. I found that experience in the process of baking a different kind of cookie daily for the week leading up to Christmas, adding to my Italian cookie repertoire. Now that Christmas is past, things are slowing down and I am hoping to find some time to do some art making as well as preparing a bit for our Mandala Workshop on January 9th. So, I am taking the time to send blessings to whoever reads this, but sharing this drawing that I did way back in 1994. I call this the Blessing Angel, who showers blessings, Peace and compassion to the earth on a daily basis. May blessings present themselves in the simple pleasures of life shared deeply and creatively to all of you. The Thrill is Gone- Still making postcards..
As I continue to make postcards for the Art Therapy without Borders, post card swap, I have to say, tthat the thrill is gone. Gone is the excitement of creating, being replaced with a sense of the obsessive need to complete the project. I know, ..... I know that I have 6 months to complete the postcards... but I feel the weight of the commitment to it haunting me, and keeping me from doing other things. So, I have been creating postcards in bits and pieces over the past week, and now I only have 3 more to make and I am done. The other day I mailed off the last of the cards to go to the US and as soon as I finish making the last three I will mail off all the international cards and be on to something new. I am often like that when some creative process turns into a creative commitments, something shifts for me and....somewhere along the line, the excitement of the initial creative response leads to the feeling of the grass is always greener syndrome...only in this case the greener longing for another art engagement of some sort. Maybe it is the colder weather, but encaustic is calling me. So these are the last few cards that I haven't shared here yet. 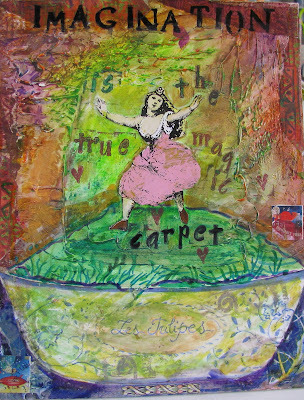 Once again, using rice papers and collage bits and pieces of ephemera, to create a visual ground and then adding words. The words for the Raw Soul Art Card came from a little box of words and letters that I keep adding to. I just pulled words from it and tried to find some wisdom from the random words. I love this Pablo Picasso quote, which I added to several postcards...."Art washes form the soul, the dust of everyday life." So artists and art therapists, and all creative beings, are explorers of spirit. May you all find the way to explore spirit through creativity in your own unique ways. Thanks for visiting, and sharing in my art process. I am having so much fun creating the next set in this series of 26 postcards I am sending out to Art Therapists around the world as part of the Art Therapy Without Borders postcard exchange. I am creating this next set in my series differently. These are all still in process. I am covering watercolor paper, with a variety of washi paper, rice papers, and bits and pieces of textured collage papers that I am once again randomly picking out from a pile of collage supplies. Some of them I am adding quotes to, while others, I am going through my baggie of cut out letters and words and finding ways to put them together in a meaningful way. The Ministry of Art came out of this process. I love to randomly allow something to come through and always am delighted and sometimes blown away by the synchronicity of it all. Is it possible is another statement that came through randomly, on rather synchronistically. random |ˈrandəm|adjectivemade, done, happening, or chosen without method or consciousdecision : a random sample of 100 households.• Statistics governed by or involving equal chances for each item. Some of them, are so lyrical without words, or images that I just might leave them alone. So far I have 11 of them done this way although I have only photographed the ones shown here so far. This art exchange includes over 350 art therapists and art therapy students participating from Singapore, India, France, Scotland, Slovac Republic, Canada, Ireland, Australia, the UK, Greece, Italy, the Netherlands, South Korea, Taiwan, Belgium, New Zealand, Malaysia, Hungary, Honduras, Chile, the United States, South Africa, Germany, Peru, Spain, Belgium, Bulgaria, Finland, Indonesia, Jamaica, Portugal, and Hong Kong. So I have finished 11 of them and mailed them out yesterday. I am posting the mixed media cards I sent out as well as my process here, for your viewing Here are the 11 postcards that I sent out yesterday , to art therapists in the USA. I plan on doing the international ones all in a group, so I only have to go once to the post office for the correct postage. My process.... I started with a large sheet of watercolor paper, I measured the size for each postcard on the back....then I created washes and played with it without any specific focus. I loved the idea cutting out each section and letting only a part of the whole be the postcard. Here is one of the watercolor postcard sections. I love the combination of orange and blue...so vibrant. Here is the card that this section eventually became. I took a folder of laser prints of some of my mandalas, that weren't extremely high quality prints and cut parts and pieces of my original art out. stamping....all around, once again randomly. my intention was to have fun, without judgement or plan. The last step in the process was adding words with rubber stamp alphabets. I really like this quote by Norman Vincent Peale. "Imagination is the true magic carpet"
Well for some reason, I am not being successful in uploading the last several images...so I will leave it be for now. At least this gives an idea of my process and the fun I have been having. My next series will be done a bit differently. I am looking forward to getting started soon and will share not only what I do, but what I receive here. Until the next time.